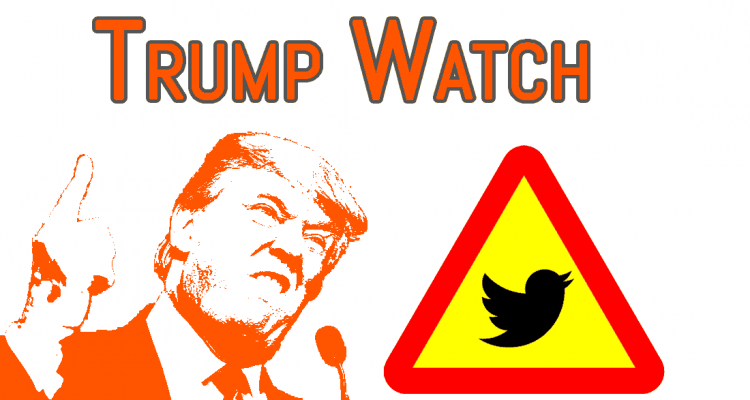 Trump Watch #14. Click for more. We’ve spent quite a lot of time on the Twittering habits, patterns, activities, and vagaries of one Donald J. Trump. However, looking at the whole dataset can sometimes hide important variations within a given variable (say, if el Presidente is obsessed with something for a month, totally forgot about it for the next two, then went nuts again). So it begs the question: has anything changed since November 2016? Let’s find out! We’ll chop the Age of Donald into 2-month segments, large enough to give us a bit of a sample to work with (412 tweets, on average, totaling 8957 words). Then, we’ll parse those to look for each of our 1000+ ngrams in each discrete 2 months segment and then aggregate them by subject. This lets us, say, see how his discussion of the Russia investigation has changed (to pull a totally random example, we swear). In other words, what’s new, Donnie? Does Trump have favorite subjects that he likes to consistently tweet about, or do his topics fluctuate as he reacts to a changing political climate? The quick answer is: both. Trump has some subjects that he always likes to natter about more often than the average politician (his economic nationalism, the Media, for example). But there are some that have definitely come up in response to the world around him (his opponents, the Deep State, his administration). So while Trump’s overall tweet volume has steadily increased over time, it’s happening pretty steadily across all of the subjects mentioned, with some notable exceptions. When the Donald feels threatened, he tweets about his opponents a lot. When the Donald takes a breath, he tweets about the media a lot. One of these two things is a constant drumbeat, and one has varied a bit. It’s also interesting that Trump does not directly talk about the Russia investigation in as unusual a way as is usually portrayed (at least as measured by tf-idf compared to the body of congressional twitter accounts). Why not? Because other politicians also have picked up some of his terminology (witch hunt, etc). He’s much more likely to say something in a wacko way about The Deep State, a concept that has caught on like crazy among the QAnon conspiracy-theorists of the world but which, for some reason, the legislative branch of that same state has been less quick to adopt. There were also a number of categories whose frequency doesn’t seem to vary all that much. His white nationalism has increased a bit, but still is a relatively rare (though incredibly remarkable and dangerous) component of Trump’s twitter habit. His shout-outs to his fawning fans in the Yes-Media and in the general electorate haven’t varied that much. They’re weird, and very particular to Trump’s ego, but they seem to be much more a kind of cosmic background radiation to Trumplandia. Oh look, it’s not just you. He is tweeting way more often than he used to. Note that the last little dip only represents one of the two months in that segment (July 2018). So no, he hasn’t suddenly stopped recently, either. Also, once you normalize tweet volume to account for the twitter character limit doubling of November 17, 2017, then his tweet length is actually down a tick compared to his tweet volume since the expansion. Though not a lot. Well, it’s clear that he’s become increasingly anxious. It’s pretty well established that Trump lashes out when cornered. He’s lashing out now, particularly at his opponents in the Democratic Party and the Deep State. Is there some breaking point, where he either snaps, crosses some line on Twitter that spurns action against him of a substantial nature, or where the platform loses its effectiveness? How will his spike in tweet volume and tweet aggressiveness affect the opinion of voters in November? And, if the composition of the Legislative branch changes, how does that affect the goalposts for #1? My best guesses are: yes to 1, but only if 2 results in the Democrats taking the House. Which is possible, maybe even likely, but far from a sure thing. No Comments on "Methodology and madness: How Trump’s tweet subjects have evolved over time"